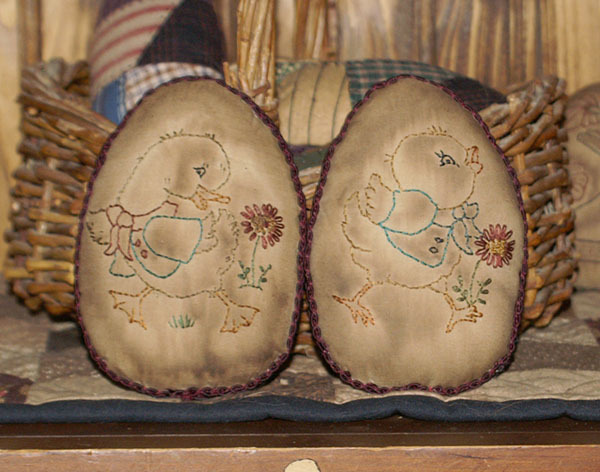 Primitive Easter Eggs and More Moki! Big Hexagons and Hippie progress! I have decided that ebay is not the way to go. Not only do they take a chunk out of sales, they now want to tack a fee onto shipping, as well. I charge exact shipping, so why should I pay a fee for that? I do not understand their reasoning. So, I am offering my Easter pieces as a set. 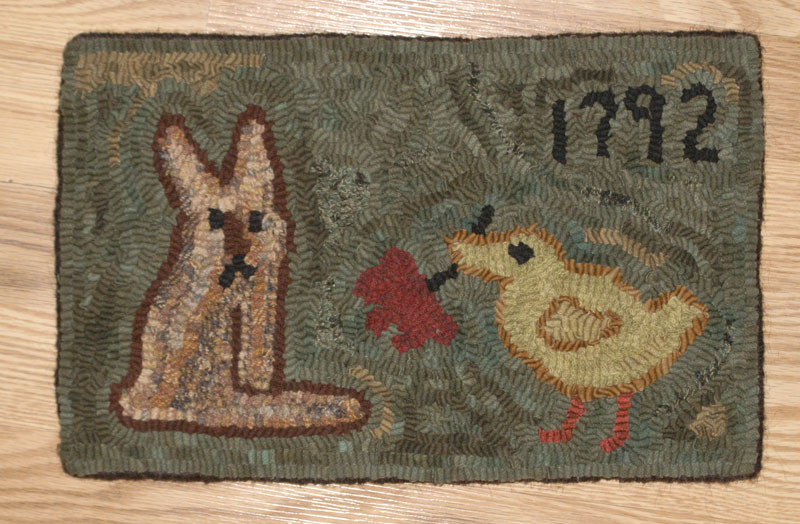 This will include the hooked rug, the punch needle and the cross stitch piece. 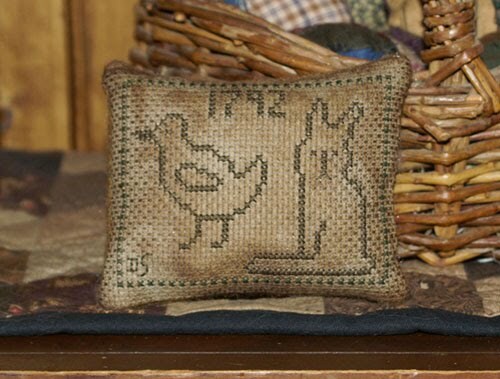 The rug is 15" x 9 1/2", the punch needle is 7 1/2 x 4 1/2 and the cross stitch pillow is 4 1//2 x 3 1/2. This is nice if you would like matching pieces for a display or you can keep one and give the others as gifts. I think it would also look wonderful in an antique doll setting. If you are interested, you can email me with questions. I have it listed on my ecrater site. The price is 140.00 for the set, which includes shipping and insurance, priority mail. 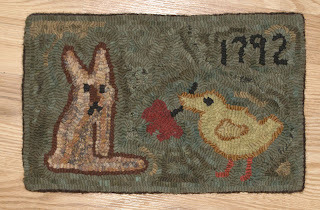 The rug is done with hand dyed wools and whipped with lopi yarn. 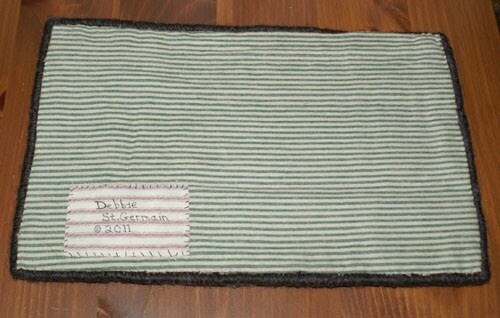 I sewed the excess backing onto the back of the rug and added a cotton ticking backing as a cover. I have also added the new single pattern to the side panel. 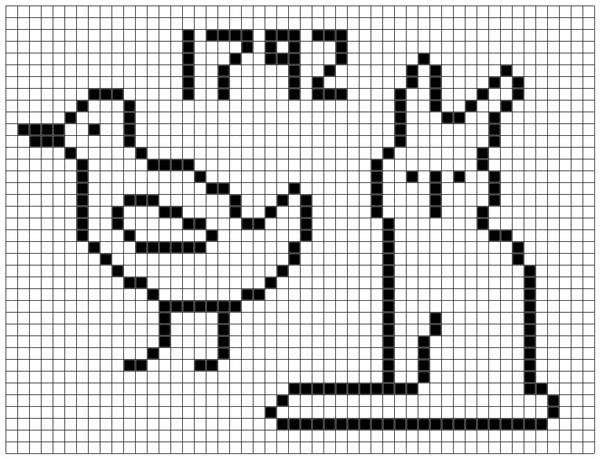 This is for both versions of the pattern, no instructions or color charts. Also, for the rest of the week, until Sunday April 3, buy one pattern and get one of equal or less value, for free. Just order one pattern and put your free choice in the comment box. And today it is Izzy's turn. 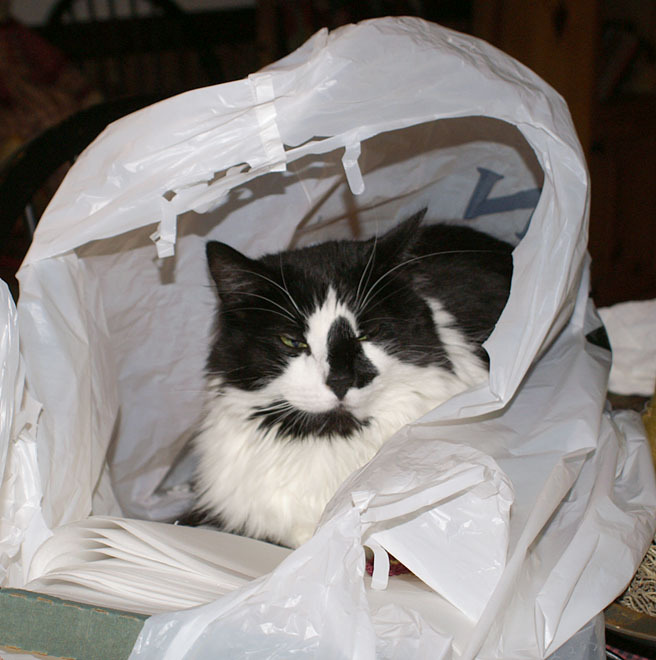 Izzy loves bags and decided to make a little hut out of my bag and use the bolt of fusible as her bed. So, how did i finish my project without a working bobbin? I wound it by hand, lol. As long as I can get a decent straight stitch, I am happy for now. I have other projects I want to finish off, so for now I can work on those till my good machine comes back. 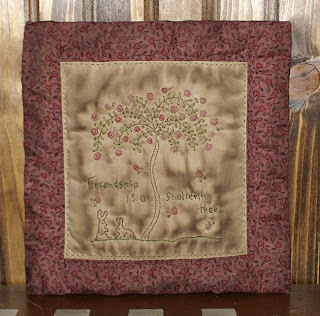 This project was done with a free stitchery by Allie. 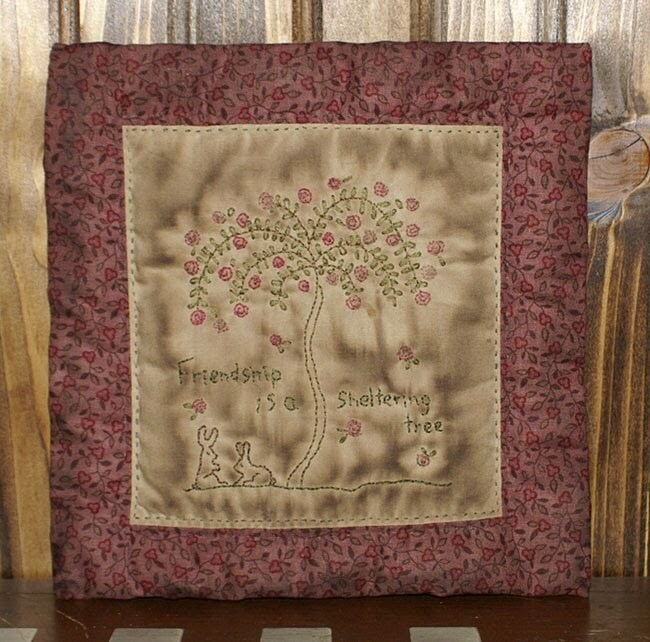 I just loved the bunnies with the rose tree and a wonderful saying. What a great piece to make as a gift for a friend. Well, today I started to use my old kenmore and the bobbin thread ran out. How to wind the thread with no manual, no idea, lol. Then I noticed on the top there was a diagram and it looked easy, but it seems the bobbin pin is missing the lever, no idea where that went. 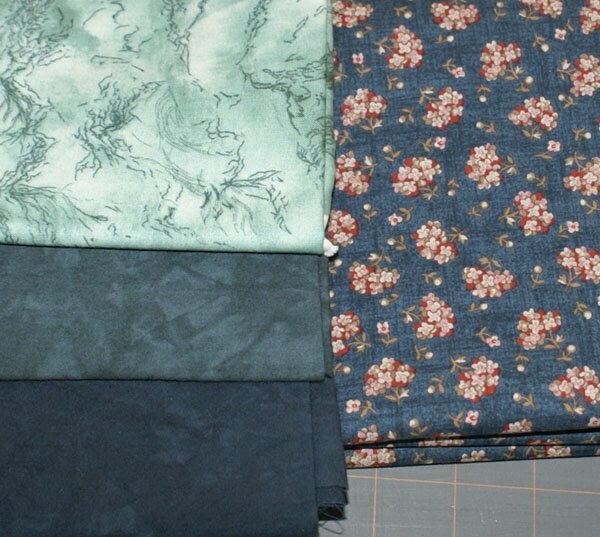 So, I cannot sew with it unless I buy a bobbin winder and they cost as much as a cheap machine;) I will have to check with my dealer to see when my machine will be done and maybe I can go in and wind some bobbins in the store. It is frustrating since I have one piece to finish and almost done with my hippie piece and need a machine to add the borders. So, for tonight, here is a photo by a follower who made my free easter piece. She did a beautiful job on the piece and love how she displayed it. Yesterday I wanted to try a free bird pattern I found on The DIY Dish. I like the idea of making one with a gusset and this one was so simple to make. I messed up the eyes, since all I had was some glossy plastic ones Tomorrow I will get better bird eyes at the craft store and replace them. 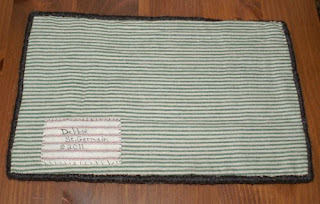 I also want to antique it, that will cover up my sloppy sewing, lol. But, my daughter is over washing her weeks worth of clothes, so I will have to wait to stain it. Then I went to work on a new piece to practice my machine applique and my machine sensor told me there is lint in the bobbin case and won't sew. No amount of cleaning helped, so she went to the shop today, I am sad. But, I will get the new upgrades while she is there, so that is good. I decided to take back the kitty fountain, they didn't like it and hey, 8 bucks is a lot to me, lol. I bought my daughter a bath mat in the sale rack and found this wonderful nest to go with my bird. Perfect for spring decorating. 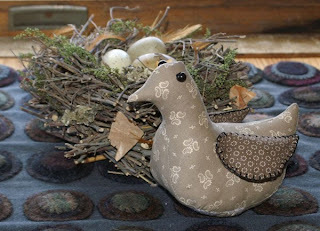 I think I will try some more birds in different fabrics, and maybe reduce it to make some small chicks too. Yesterday I needed a sewing break, so I made a new type of egg. I had the plastic eggs that I got and wanted to do something with them, so I thought, why not try decoupage with them. So, I took both the large and small plastic eggs and sanded them a bit to roughen the surface. 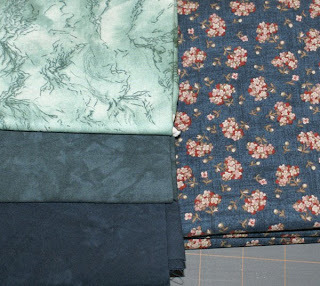 Then I Took out my scrap box and cut up pieces of fabric in varying shapes. I used a paint brush and brushed on some decoupage, then placed a piece of fabric on the egg, then brushed over the fabric with the decoupage again. You want the decoupage to soak into the fabric. I kept doing that, until the egg was covered. Once they are done, I set them on wax paper to dry. When they were dry, I coated them with a mix of decoupage and walnut ink to antique them. Then dry again. Then I lightly sanded them to give them a worn look and reapplied walnut ink. I wet the brush with a dab of water, just enough to make the walnut coat lightly over the egg. So, if you would like to try your own, it is not hard and can be done with dollar bags of eggs. A great way to use up those small scraps. Or you can use fun prints and let the kids have some fun too. My eggs were the type you open, so you can use those. I also had tabs on mine, so you do need to sand that piece down so it doesn't stick out in the cloth. Also, if you can get plain ones, that is best. Mine had painted designs which uses up sandpaper faster, since the paint goes onto the sandpaper. The photos isn't great, flash always makes things look shiny. I need to make some prim chicks or something to add to the bowl. 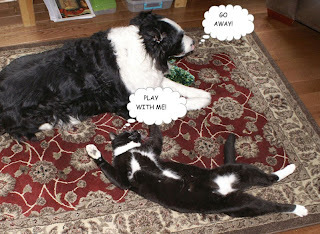 Moki was in his cute mood today and has been running around with his toys and trying to get Casey to play with him. I finally got around to finishing off my bird piece. This is a pattern I found in an old Better Homes and Gardens magazine, done by Carol Armstrong. 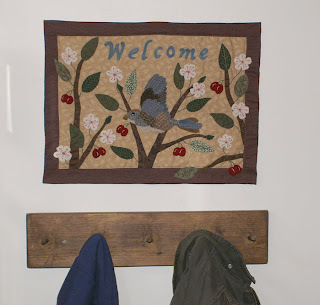 I love how it came out and wanted to use it for my entry way to bring some spring into the house. I added the Welcome by using a script font and then tracing it onto freezer paper and using some of my hand dyed wool. 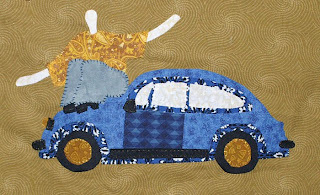 I would have liked to add quilting to it, but with the wool, I cannot get the free motion foot around those pieces. 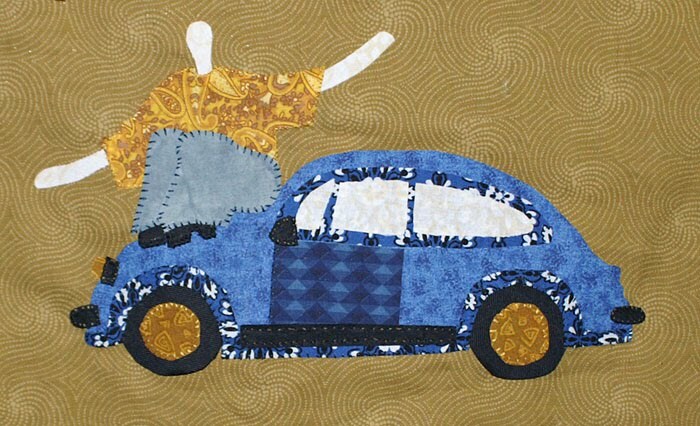 Next time I will do the quilting first, then add the appliques. I ended up doing a simple double border stitch to take the sandwich together. This is where I put it. 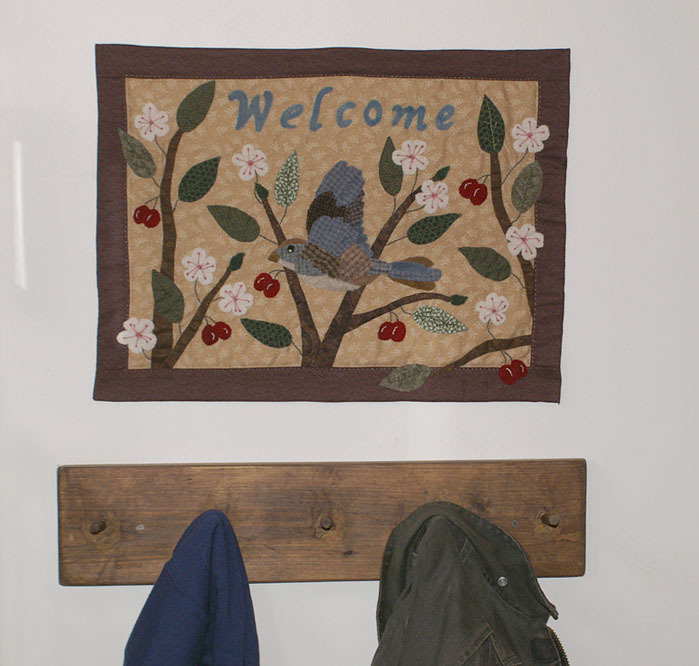 My husband made me a smaller coat rack after he added wainscoting to the walls. The wainscoting goes down the stairs at an angle, so I couldn't use my large straight one, anymore. 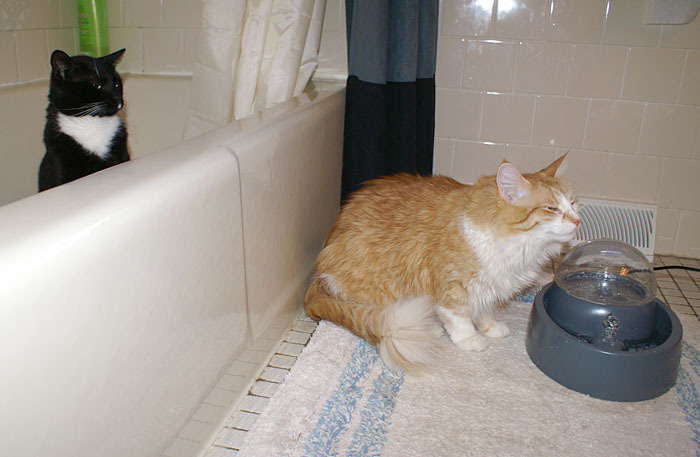 As for the kitties, they have lost interest in the new bubbler. It seems the bubbler is too intimidating, they rather have running water to play in. I did a lot today, compared to the last months, but it sure was nice to get out. Then we hit a store and bought the kitties a new toy, a water fountain. The minute I started it up, they all came running to check it out. Dora got there first and went right for the bowl to drink. Then she left and moki checked it out and played with it for a bit and back came Dora, so Moki took to his favorite safe spot, the tub. He was not happy that he had to hide out while she played with the new fountain. You can see that Dora is delighted with herself, she does not like Moki having anything that she considers hers, which includes everything. Izzy wouldn't go near it, she wanted her little drips in the faucet. 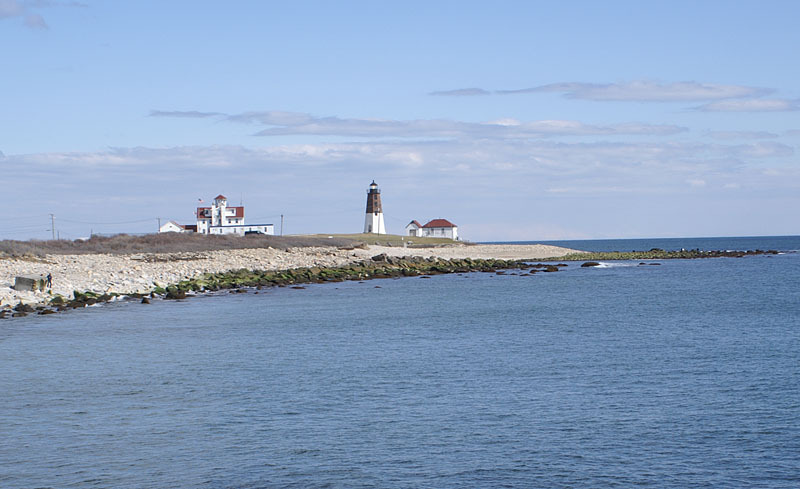 To round off the day, we headed to the breakers at Point Judith. 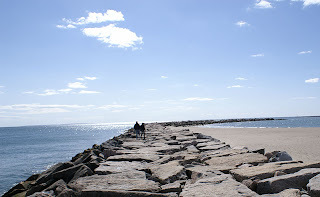 It was a beautiful day, nice fresh air and the sun was out. 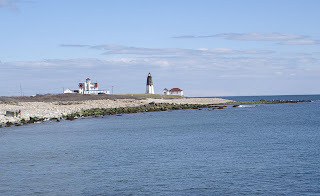 You can get a nice view of the lighthouse and the coast guard house from the rocks. 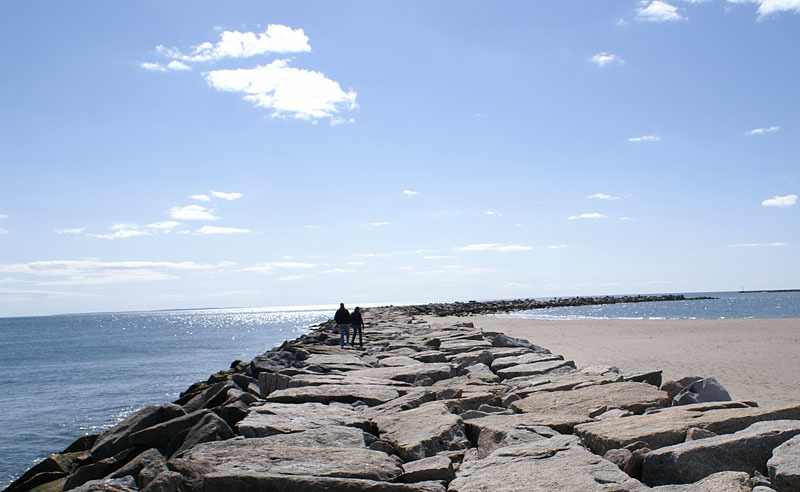 A few people were taking advantage of the weather and low tide, you can walk all the way out at low tide. Bill enjoyed the view, not to mention he is wearing two different black shoes. He realized it when he looked down at them in the store. 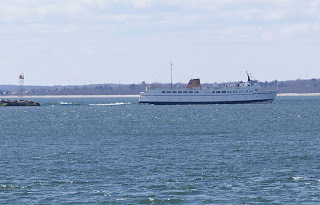 We stayed and watched as the ferry came in for the afternoon run. 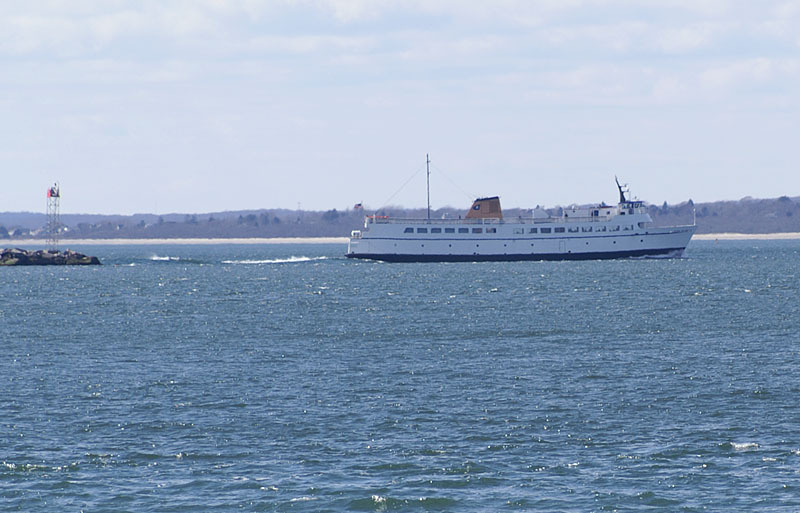 This is the older ferry, which is slower, but who wants to hurry when you are out on the water. A nice end to a beautiful day. I got an idea in my head, so had to try it. I have way too much time on my hands, lol. I wanted to try my large hexagon die with a fussy cut. Of course I had nothing that worked in that size. So, I remembered the charm packs that I won and thought, these would work perfect. The nice thing is, they fit the die just about right, what little I lose on one edge, doesn't effect it, since I have a 1/4" seam and that part goes under. 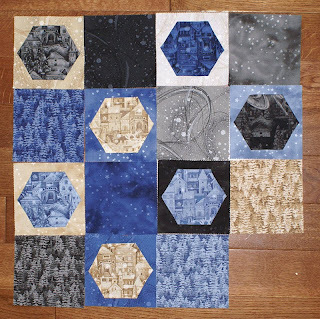 I appliqued the picture hexagons onto the other colors and then thought, maybe I can put a plain square in between. Not sure if I like it as is, I might add a smaller hexagon in the middle of the large or do a snowflake stitch on them. I just threw the colors together, I can plan it out better, once I get enough to finish a lap sized. I think this would be nice with a machine satin stitch, and if I turned the edges over better. I also added more to my hippie piece. I realized that it is a good memory piece for me. The first time I met my husband was when a friend asked me to go to a concert, and Bill was driving. We went to see an outdoor free concert by Aerosmith, and he was driving a blue VW. I wish I had added more hair, yes mine is that thick, lol. I was a blond then, but the brown shows up better. 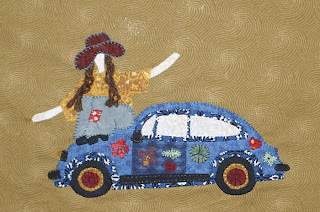 I plan on adding "Dream On", in stitches, since that is Aerosmith's first song, thought it would be perfect for this piece. I am still recovering, the cillin kicked in and my lungs are clearing, but it tires me out. So, I spend more time on the couch resting, but try to do things around the house to keep my body moving and my lungs working. 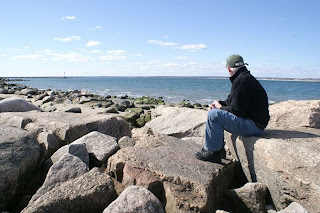 I look forward to some warm days when I can get out and take some walks again. I worked a bit on my hexagons. It is all hand sewn, no paper, so takes a lot of time. I wanted to see how the golds looked around the outside and am happy with the results. 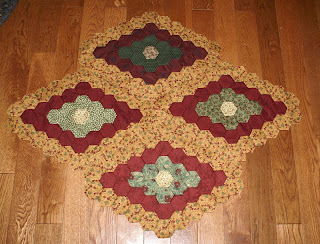 I will continue to use what greens and reds I have and use the same gold fabric for the outer border. I like how the diamonds look like they are sitting on the background. I had to take a side picture, but it will have the triangles going upward for the length. Each Hexagon is 20" in length. Yesterday I wanted a break and something fun and goofy to do, lol. I found this design on a coloring page, I was looking for peace sign ideas for my daughter. But, I saw this and just had to try it in fun colors. I used heat and bond to iron the pieces down and dmc floss for sewing. I am doing raw edge and once it is all sewn down, I will add the fun details. 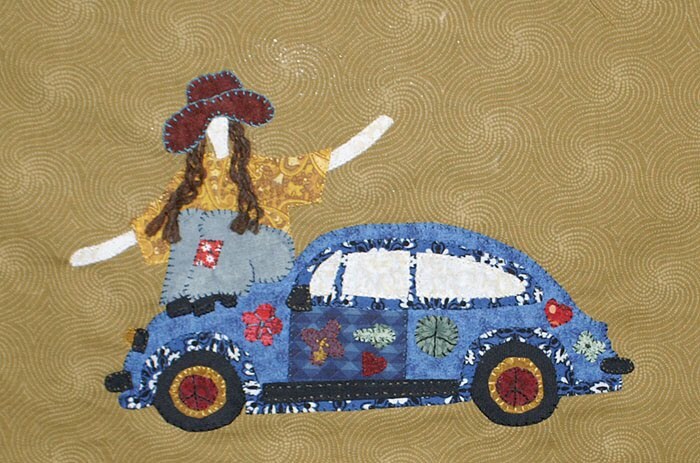 There will be flowers and peace signs on the car and I may even add a kitty laying on the top;) The girl has an afro, but I thought I would give her long hair and a floppy hat. It is just something fun that I can add to, as I go. I must be feeling better, I can't sit still anymore, lol. So, I made up some eggs this weekend with vintage embroideries. These were fun to make and I like using color for these types, reminds me of the 50's. I had some old trim and used that to go around the outside edge. 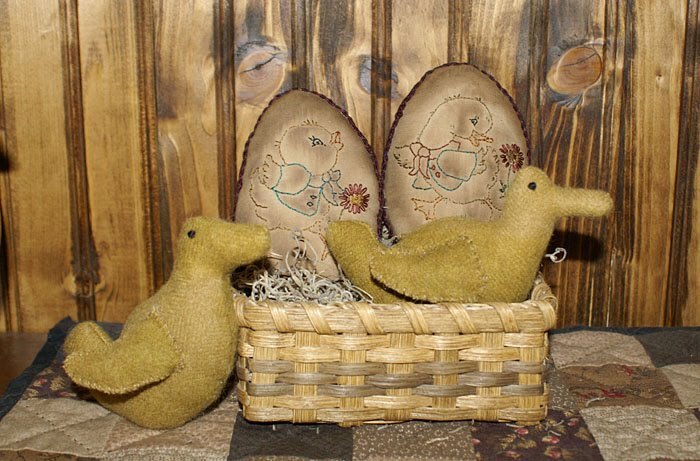 I wanted to make some chicks for my baskets and decided to try my duck design. As you can see, my ducks are a bit sad looking, lol. I used my camel hair wool and think it would be fun to try smaller chicks and maybe brush the wool to get the fluffy look. I am finally feeling halfway human again, though today I realized I won't get better if I don't take medicine, so I got some. I hate cillins, I am allergic to molds, so any cillin makes me stupid and cranky, lol. But, being sick for a week was enough to make an angel cranky;) It seems everyone is getting this one and getting it bad, even my husband had to go on cillin the other day. Now, onto the giveaway, which will be two winners, since I made everyone wait so long. Since I did not get the new pattern done up yet, you can pick from any of my patterns that I have listed on my ecrater site. Winner number one is Flutterbygone...Tracie! Winner number two is coinguyslady.... Vicki! Email me with your choice of pattern. 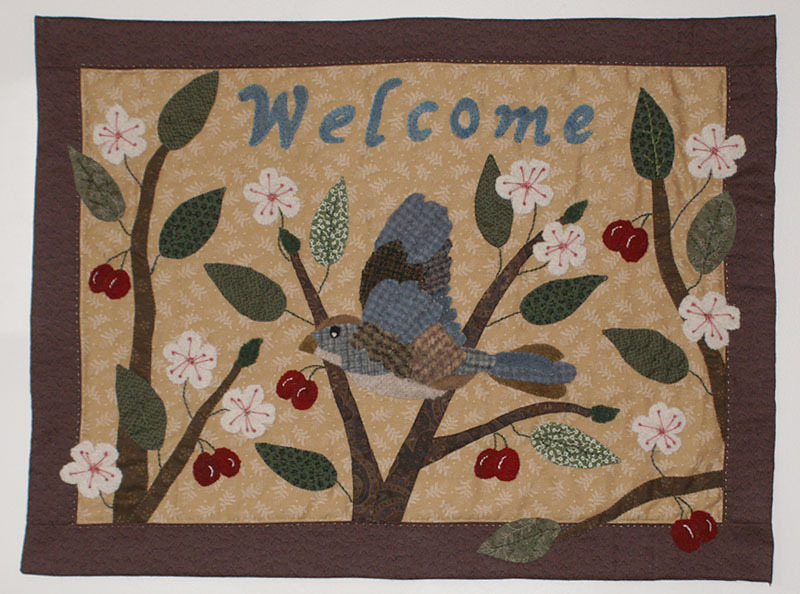 And for being such good sports and playing along, as well as all the well wishes, a freebie from my new pattern. 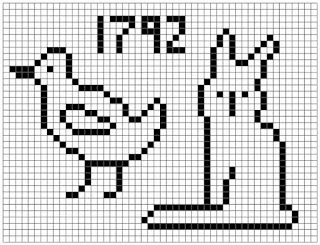 This is a cross stitch only, you can use it for personal use or to make as gifts. You can use both together or by themselves. 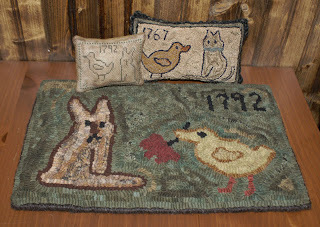 If you are looking for the pattern as a rug or punch needle and to sell the finished piece, you need to buy the pattern. I hope you enjoy the piece, I did a quick version for something to show. You can keep it simple and prim, or add color and a border if you would like. I did my piece on 14 count oatmeal and #3021 for floss. Due to illness, I have bee unable to do anything on the computer this week. I will do the drawing and maybe a surprise for all. I finished my newest piece today. I just had to try the design in a hooked rug and love how it came out. Of course I took night photos, so hard to capture the primitive colors without getting a lot of contrast from the flash. 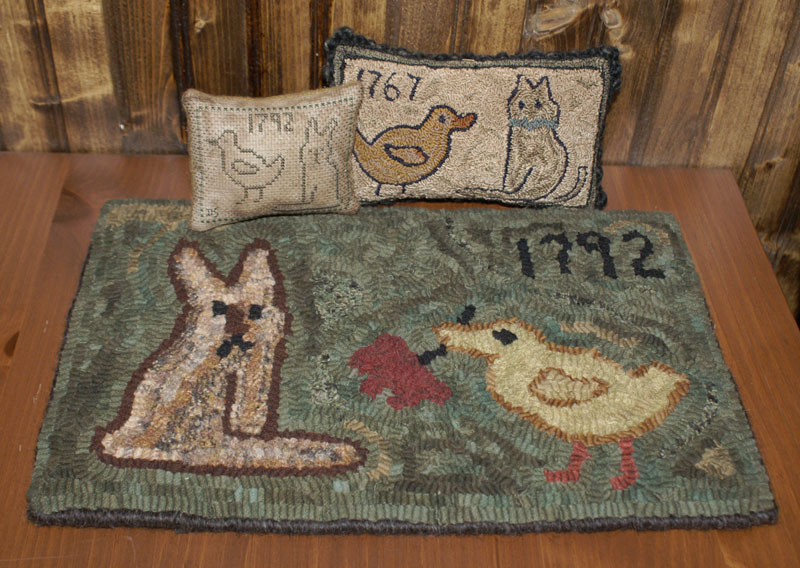 I used recycled and new wools and mixed in colors and textures to give it an antique look. I also realized that the chick needed a flower, so I added one in this piece. Now I need to do up the pattern for the new pieces. It will contain all 3 versions that I did. This will be the pattern for the giveaway, but if you are not into easter things, the winner can have their choice from any of my patterns. 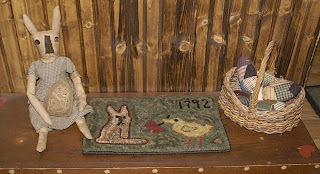 I sat it with some of my easter items, the rug will be for sale this weekend. I really need to sand down that bench and prim it up. 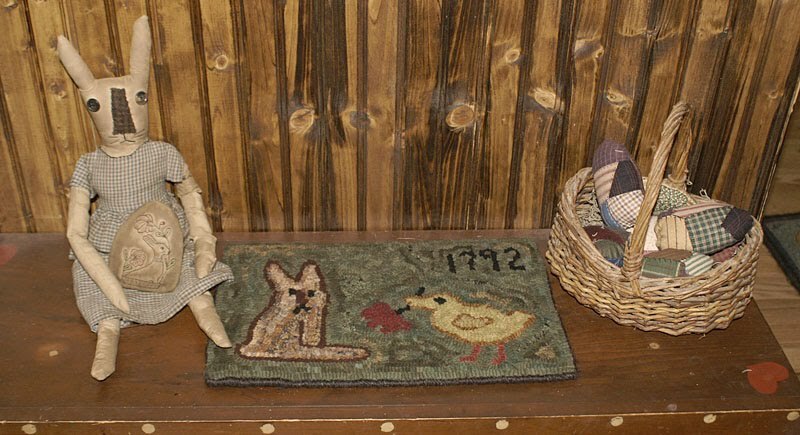 What i really want is for my husband to build me a bucket bench, to put there;) I got some of my yellow camel hair wool to try some chicks with, for bunny. We shall see how they turn out. I have been having fun reading your comments and seeing the names you have picked out for her. Here is a closer version. I used wool yarn to border the edge. 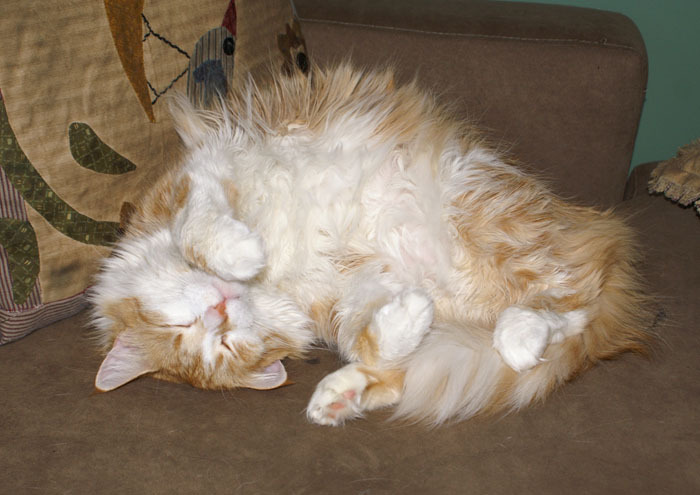 And last but not least, I know how much you love kitty pictures. 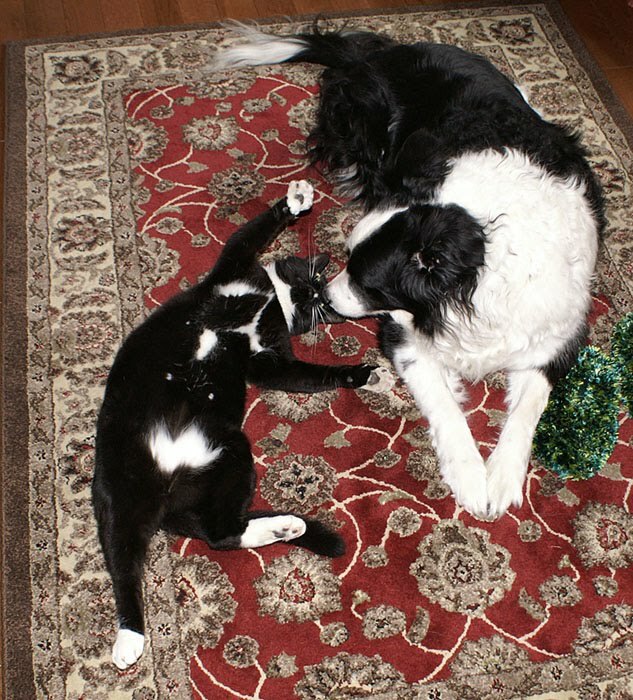 Dora is so jealous of moki, she does not like me to love anyone but her, so I have to love Moki and Izzy when she isn't looking. So tonight is Dora the queen's turn;) She does know how to look cute, when she wants.